The shop where I found the carpet is just down the street from our apartment. I am now a dedicated customer! One of my favorite things about living in Morocco so far is the strong thrifting/reuse culture. While one can certainly buy new clothes, household items, appliances and furniture, it’s just as easy to find used items, and much of the time the used items are better quality, perfectly functional, and cost much less than buying new. And rather surprisingly, I often find things here that are made in Spain or other parts of Europe. Oh, how happy it makes me to ‘reclaim’ items that someone far away has discarded! My enjoyment of thrift shopping is also helping me integrate into our community, as I often chat with shop owners and other customers as I look through the various wares. Carpet Cleaning Stage One: beat carpet lovingly with broom to loosen dust. Reflect on how lucky one is to find such a zwin (beautiful) zrbiya (carpet) at a Moroccan thrift store. Carpet Cleaning Stage Two: wash carpet carefully but thoroughly with water and mild soap. Pray there won’t be a dust storm given all the effort it took to clean the carpet. Carpet Cleaning Stage Three: allow carpet to dry in the hot Moroccan sun. Check status of drying every 10 minutes as an excuse to gaze upon its magnificence. Earlier this week when I found a fantastic carpet at one of the many thrift stores in our town. Thomas and I bargained down the price from 200 dirham (MAD) to 170 MAD, or $17 USD. That’s right! $17 for a really beautiful carpet! Mind you it was quite dusty when we purchased it, so I spent the next three days carefully but thoroughly cleaning it. And of course I also started researching what type of carpet it was–I suspected it was not a Moroccan carpet, and I was right. 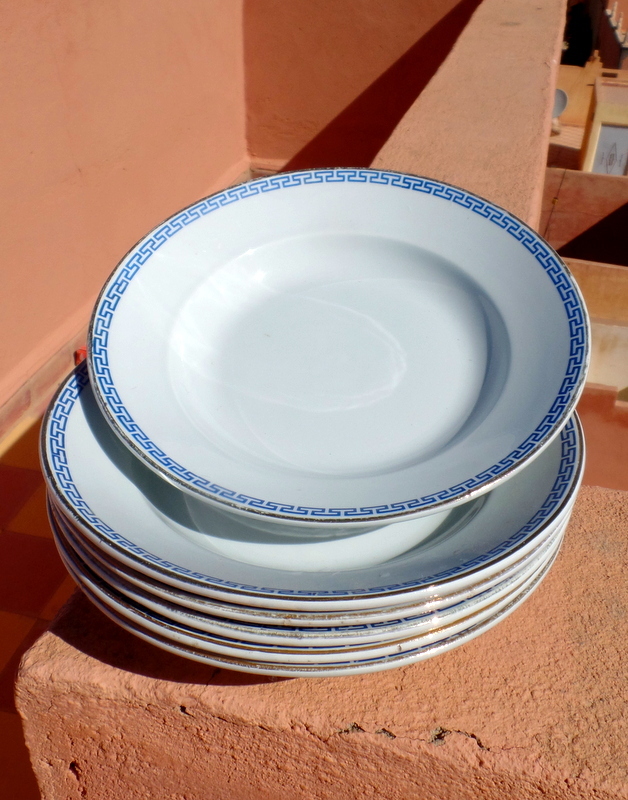 Porcelain dishes from Sevilla Spain. Although there was a seller’s label attached to the bottom, the condition of the label was very poor, and I could only make out that the carpet shop was Lorenzo Serra Perich in Barcelona, Spain. Try as I might, even with my jewelers loop, I could not read the faint typed words that identified its origin. So I turned to Google. After lots of looking I am quite certain the carpet is from Turkey, and is made in the Sultanhan tradition. This means it is from the Central Anatolia region of Turkey, specifically from the province of Aksaray. Imagine that, a lovely Anatolian carpet all the way down here in SE Morocco! Oh, this deep green glaze just about makes me swoon! While the carpet is my favorite find in my thrifting so far, there are other things we have acquired over the last month to make our home both more functional and more aesthetically pleasing. 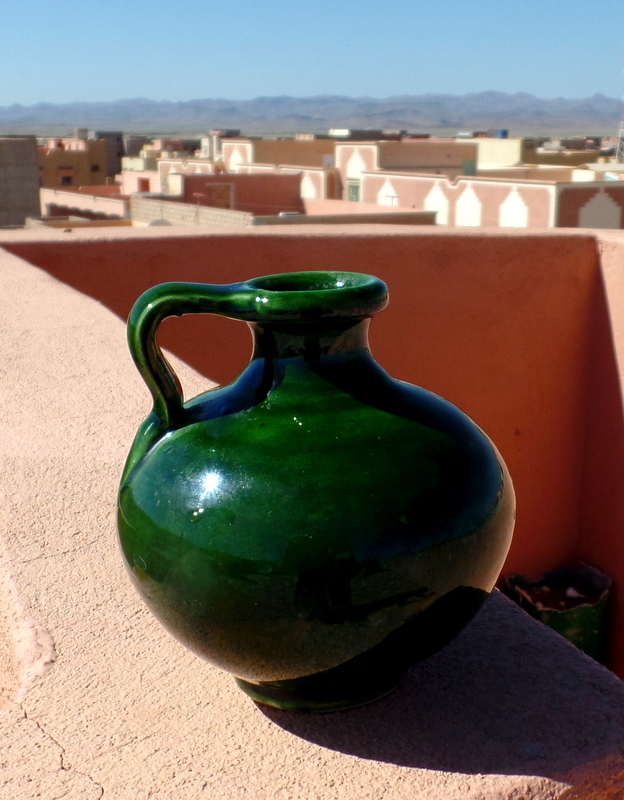 I snagged a set of six lovely porcelain bowls from Sevilla, Spain at the souk a couple weeks back for 25 DH, and last week I found a hand-thrown pottery vase for 5 DH that is glazed in such a gorgeous green I just had to bring it home. Yes, it seems like a basic pot, but it’s actually quite special! 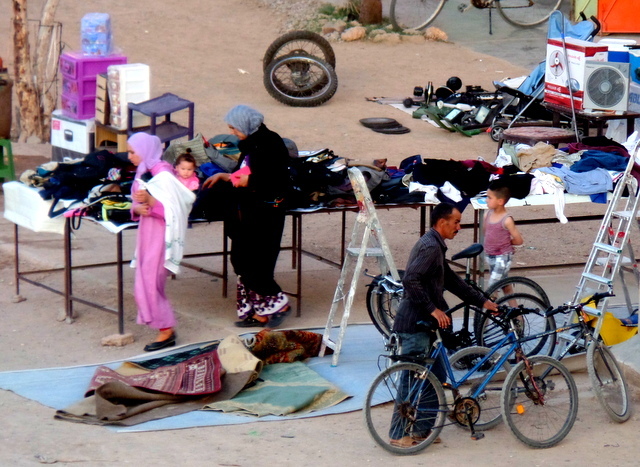 So there’s my spiel about buying used here in Morocco! There is always good stuff to be found, and sometimes really good stuff to be found. 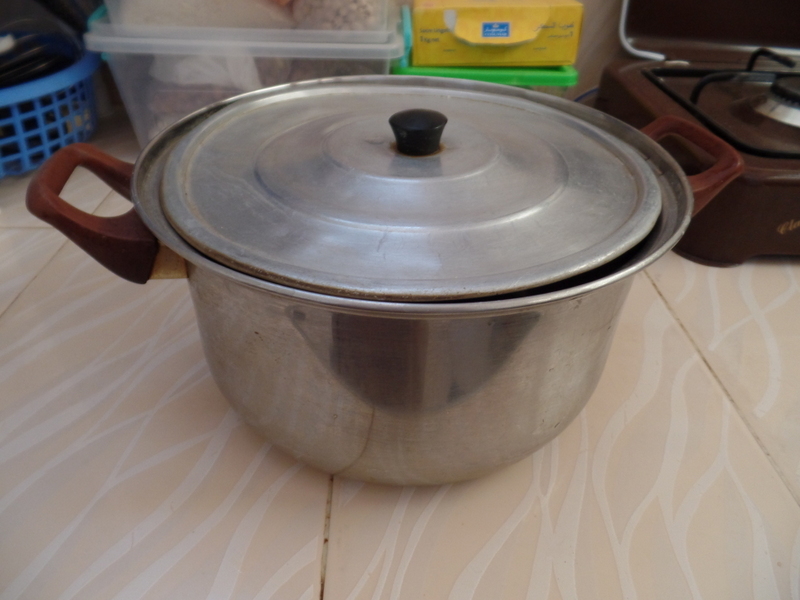 On a side note, I have to mention that much of our kitchen-ware was inherited from the previous Peace Corps couple who served here, and they left us some really great stuff (like a budagas oven and a groovy silicone bowl cover that looks like a sunflower). Best pot ever! Love you, Mom! 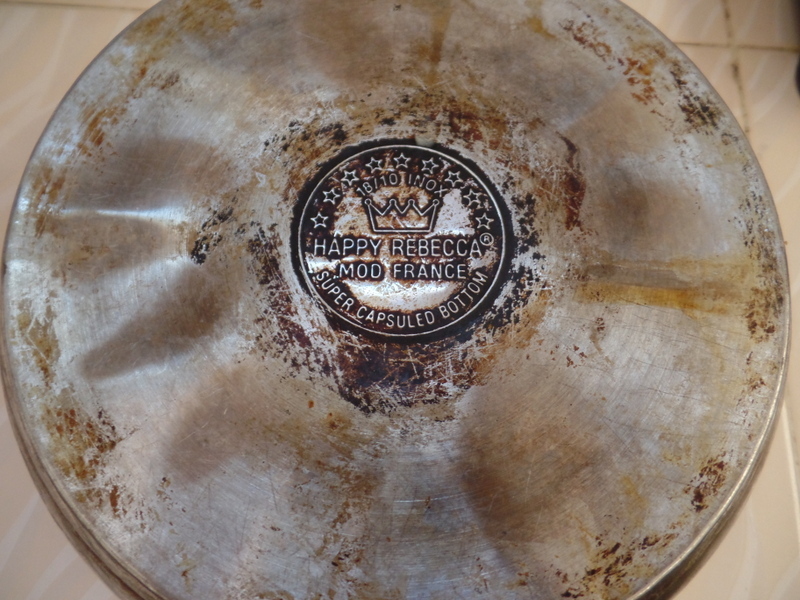 But look at the best thing they left: a presumably simple cooking pot whose brand name reveals it to be a testament to my Mom: Happy Rebecca! Every time I use this pot I think of our shared love of cooking and can feel her presence with me here in Morocco. oh I am SO jealous. I love thrifting! I did buy Steve an egg cup at the souk but so far I haven’t found much here. I’ll keep looking. I love that you get think of me when you use your Rebecca Pot! We do share the love good food and beautiful things. Your carpet is lovely. Definitely a great find. And you have your father’s sense of valuable things that are journeying through the world. So you are obviously in the right place to do this. Enjoy your finds and keep sharing them with us. I know your many readers are enjoying your adventures with every blog.